According to an article in the MetroWest Daily News, an Ashland woman smeared raw bacon on the dispatch window of the Framingham Police Department last week. The article states that the woman walked up to the dispatch window of the police station with a Dunkin Donuts box in her hand. An officer asked how he could help her, and she responded by stating that she was there to “feed the piggies.” She then reportedly pulled a large handful of raw bacon out of the box and smeared it on the dispatch window, leaving grease marks. Following this conduct, she flipped over the Dunkin Donuts box and spilled several sausage links onto the counter at the window. Two officers then confronted the woman and told her she was under arrest. 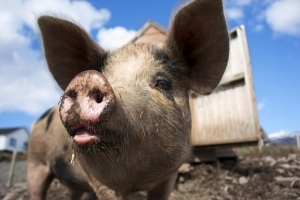 When one of the officers asked her why she engaged in this behavior she said, “God told me to feed the piggies.” She was subsequently charged with one count of disorderly conduct and one count of malicious destruction of property under $250. At her arraignment, the woman told the judge “’they are allowing people to sell me and traffic my body.” She also stated “someone is out to get me. I don’t know who it is, but someone is out to get me.” Following these comments, the judge postponed the arraignment and ordered the woman to undergo a mental health evaluation. For the Commonwealth to convict the woman of malicious destruction of property under G. L. c. 266, § 127, it would have to prove the following beyond a reasonable doubt: (1) that the woman injured or destroyed the property of another; (2) that she did so willfully; (3) that she did so with malice; and (4) that the amount of damage inflicted to the property was less than $250. For the Commonwealth to convict the woman of disorderly conduct under G. L. c. 272, § 53, it would have to prove the following beyond a reasonable doubt: (1) that the woman either engaged in fighting or threatening, or engaged in violent or tumultuous behavior, or created a hazardous or physically offensive condition by an act that served no legitimate purpose; (2) that the behavior was reasonably likely to affect the public; and (3) that the woman either intended to cause public inconvenience, annoyance or alarm, or recklessly created a risk of public inconvenience, annoyance or alarm. The woman appears to have a strong defense to each of the charges. As to malicious destruction charge, it appears that the Commonwealth will have a very difficult time proving that she caused any damage to the property. Given the fact bacon grease can easily be wiped away, it seems that the woman will be able to successfully argue that the property was not in fact damaged in the way contemplated under the statute. As to the disorderly conduct charge, the woman appears to have several arguments that she could make. First, she can argue that her conduct constitutes free speech – i.e., she is allowed to express her opinion of the police – and is thus protected under the First Amendment. Further, even if this argument fails, the woman is still in a position to argue that the first element of the crime was not met, as her behavior does not appear to constitute fighting or threats, does not appear to be violent or tumultuous, and does not appear to have created a hazardous condition. Finally, even if all of these arguments fail, the woman may be able to argue that she is not criminally responsible for her conduct, as it appears that she may have been suffering from some mental health problems at the time that she engaged in the allegedly criminal behavior. No matter what defenses the woman may raise, however, she will still need an experienced defense attorney to make sure that she obtains the best outcome possible. Likewise, if you or a loved one has been charged with a crime, you will also need a skilled attorney. Attorney Daniel Cappetta practiced as an assistant district attorney for a number of years before becoming a criminal defense attorney. He knows the ins and outs of both sides of the courtroom and makes sure that all of his clients are zealously represented. Call him for a free consultation today.